During these perambulations, I make an effort to remove trash that’s potentially dangerous to wildlife. 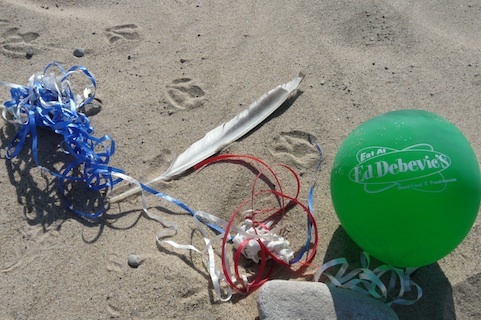 My recent outings (two on national lakeshore beaches, one at the municipal beach, and two on the pier leading to Indiana’s only working lighthouse) yielded tangles of fishing line, some with hook still attached, and balloons, most with ribbons attached. A couple were mylar, most were latex; one still partially-inflated balloon encouraged me to “Eat at Ed Debevic’s” diner on North Wells in Chicago. It had drifted across the lake to arrive on our shore a piece of trash, at best; at worst, a shriveled booby trap, anchored in the sand and bobbling in the wind like a macabre, invasive species. 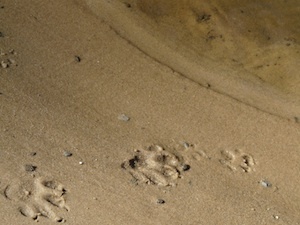 Still, our actions impact a wider world and other beings, and that’s a valuable lesson for children to learn, also. My hometown, with its stretches of spectacular shoreline, offers teachers and parents a unique, educational “laboratory” to help kids understand some of the consequences of our behavior for other species, providing the impetus to explore alternatives to potentially harmful activities like balloon releases. Also: Ocean Conservancy Beach Debris Data – here; Marine Conservation Society (U.K.) here (check out the cool poster for their “Don’t Let Go!” campaign); Save the Whales balloon alert; and Beach Chair Scientist, here. There are many more online resources. I’ve never been party to a balloon release and never gave the issue much if any thought. But now that you’ve brought this to our attention, Kathleen, I’m eager to share your warnings with whoever is receptive. I’m convinced that all of us, at heart, want to be compassionate, want to keep our earth clean, want to do no harm. Who knew? Thanks for the heads up! I live across the street from a community park that has a lake – Often families will do birthday parties and other celebrations – Yes, with balloons. I’ll be much more diligent in the future to pick up after the trash they (always) leave behind.